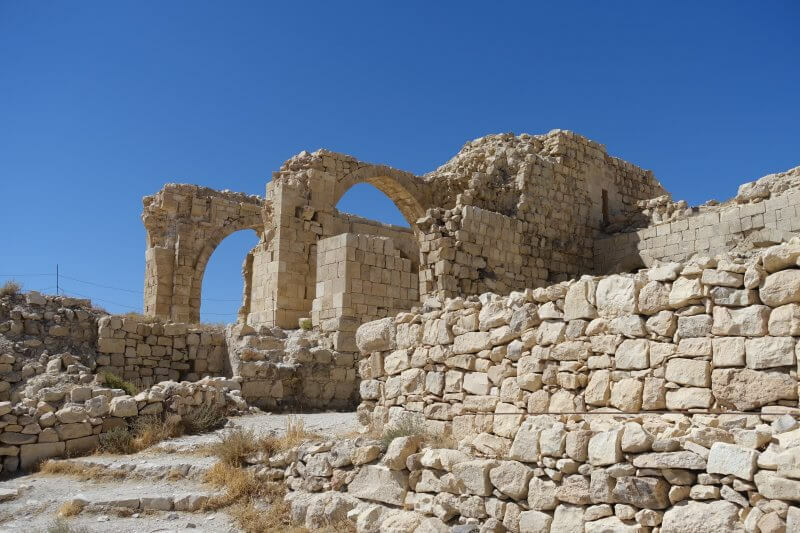 Shobak isn’t yet a firm fixture on the tourist trail. 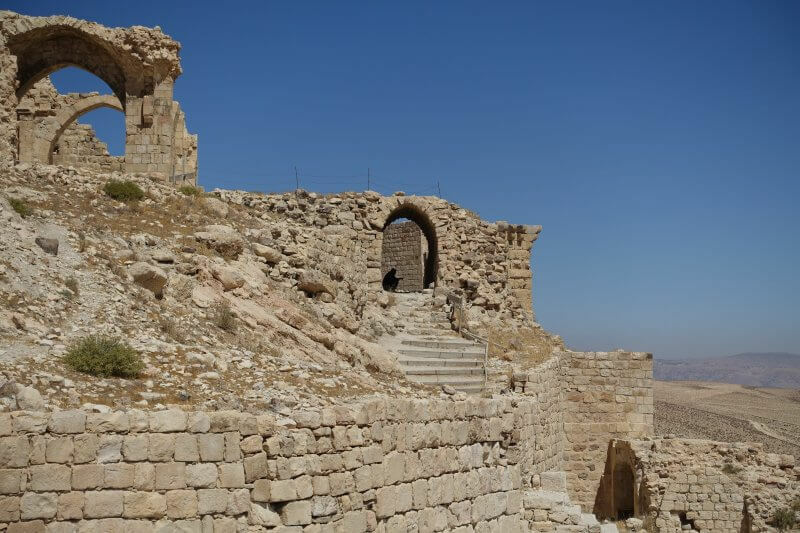 Most people head to Karak (or Kerak or al-Karak) Castle, which I visited soon after Shobak. 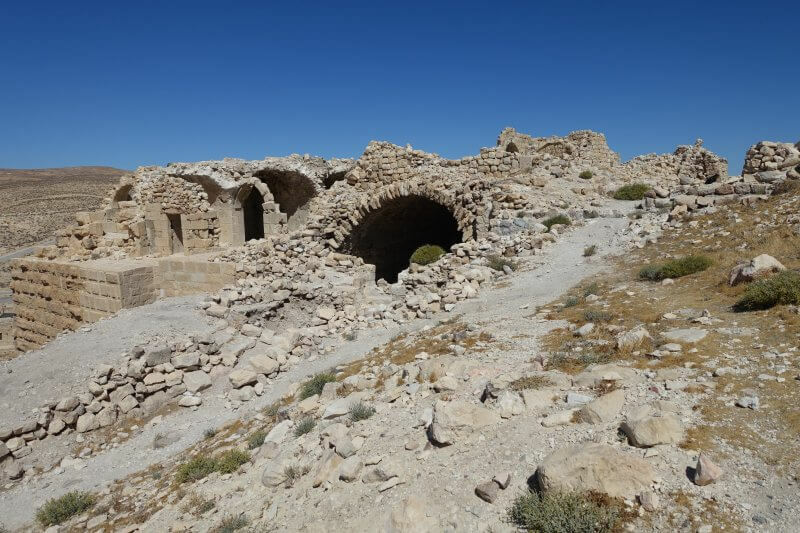 But the ruins at Shobak, while less extensively excavated so far, remains very impressive. Its hundreds of years of history and stories on how it changed hands dramatically over that time only adds to its intrigue. I won’t go into details here but you can read more about the history of Shobak Castle on this Wikipedia article. 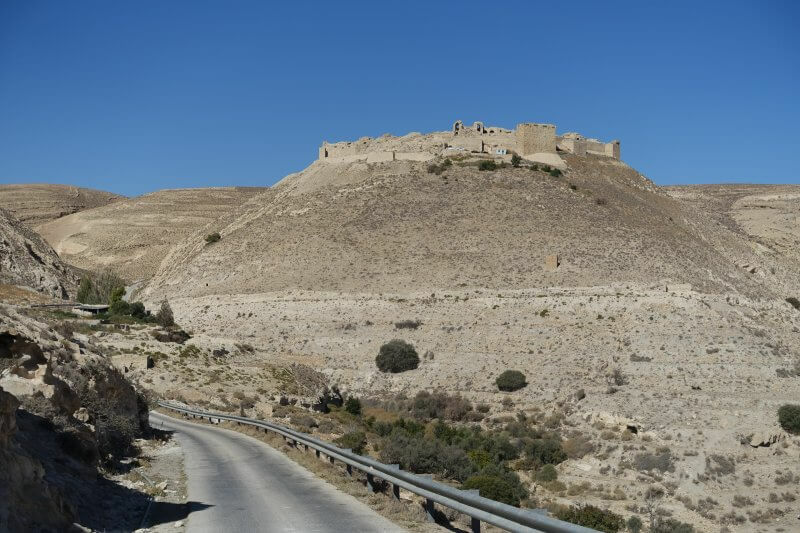 Getting to Shobak Castle is like getting the name right-there isn’t one direct way of doing it, but most the options will get you around there. 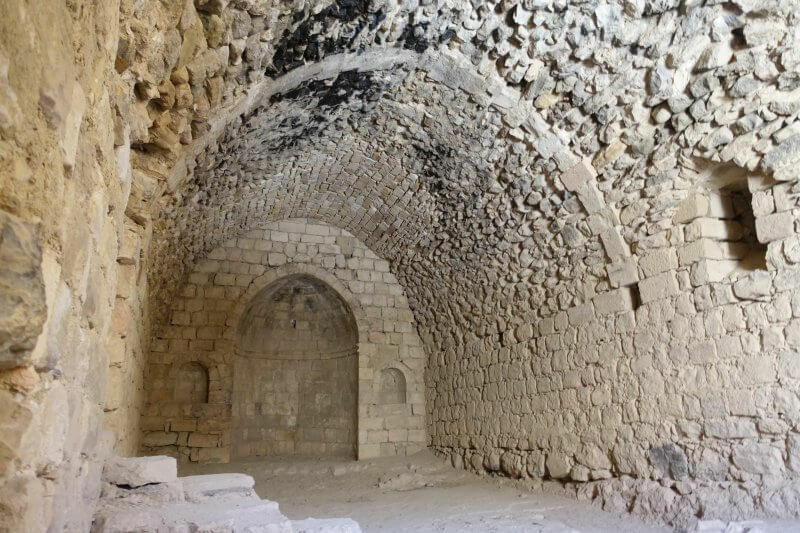 Sitting approximately 3km (2 miles) from the King’s highway, a possibility is to hop on buses/ cars traversing the King’s highway and dropping off at Shobak town. 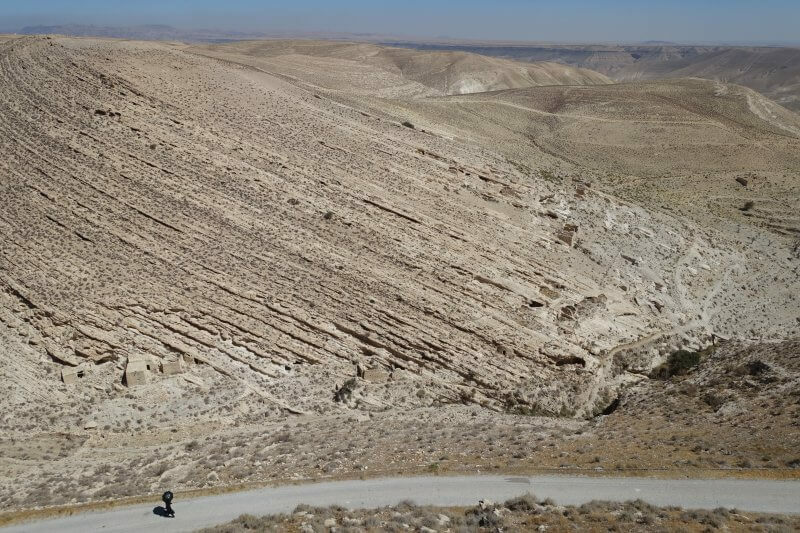 I had my first hitchhiking experience ever getting from Dana Village to Shobak, and it was easier than expected as hitchhiking is common in Jordan. Some drivers (or taxis) may ask for payment but others will gladly stop and give you a lift if they see you by the roadside, even if you did not stick your thumb out. 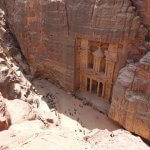 I’d presume you can do the same from Petra/ Wadi Musa as Shobak sits between Dana and Petra on the Desert Highway. If you’d prefer more certainty, getting a taxi or hiring a driver should cost about 25-30JD (according to forums) for a round trip from Amman. I was quoted 15JD for a roundtrip from Dana Village. 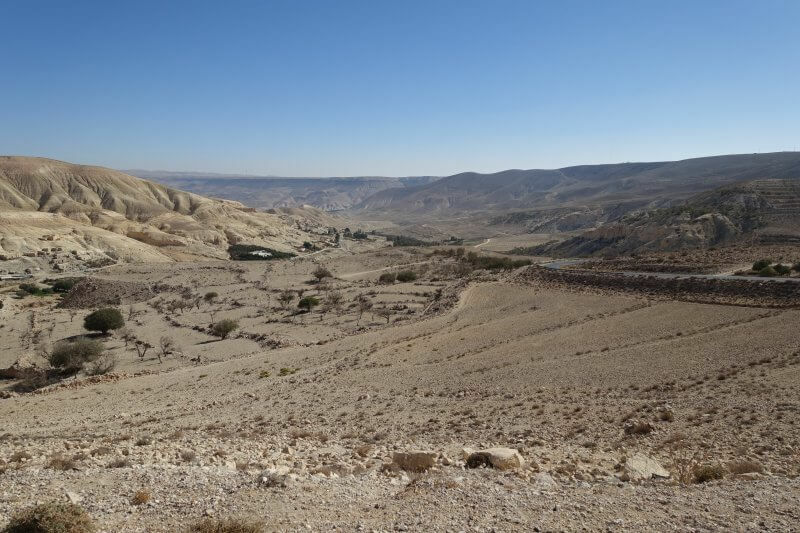 The Desert Highway (and the desert), from the edge of Shobak Town. The road from the highway to the castle is a little quiet. I didn’t manage to get a lift all the way but enjoyed the walk. After a couple of turns, the castle came into view, impressively set on the top on one of the taller mountains. 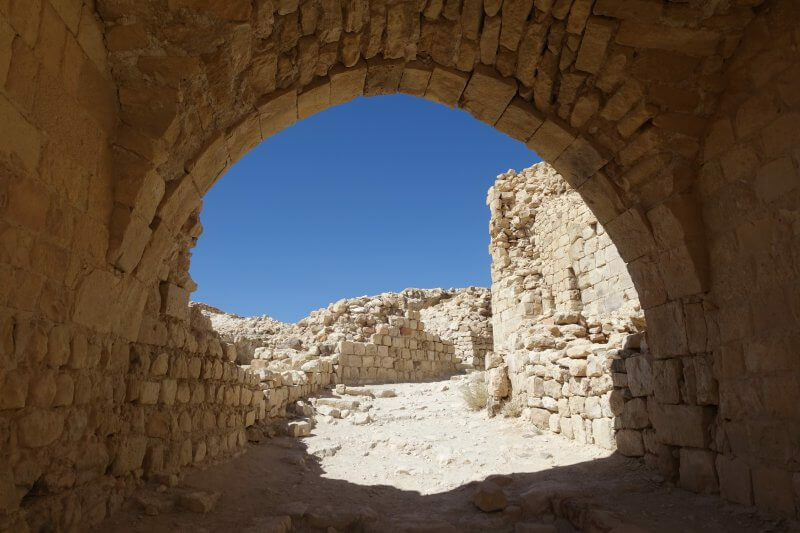 Shobak Castle, sitting pretty on the desert mountain. Wait, why are we talking about hotels here? If you’re driving or following a tour straight to the castle you might miss this. Even if you’re walking in, like I did, you might miss it, like I almost did. But if you didn’t miss it and some time to spare, dropping by Abu Ali’s humble abode can be a really special experience. As I was walking towards the castle, just a couple hundred meters before it, an old man by the roadside called out to me, inviting me to his house for tea. 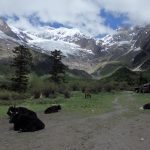 Worrying that this may be another scam, I hesitated, but for some reason relented in the end, entering the house that seemed more like a cave by the side of the mountain. Inside, photographs of the royal family and other famous personalities who had visited plastered the walls, and a table by the side displayed all sorts of ornaments presumably from the surrounding mountains. Mr Abu Ali immediately got to preparing Bedouin tea, with a healthy (or not so healthy) dose of sugar, as would be in Jordan. We started chatting over tea, and while I did not understand too much of what he mentioned, I could feel his sincerity and warmth in receiving strangers. Later, his friend, a Bedouin shepherd, visited, and while I did not understand their conversation, enjoyed their company. 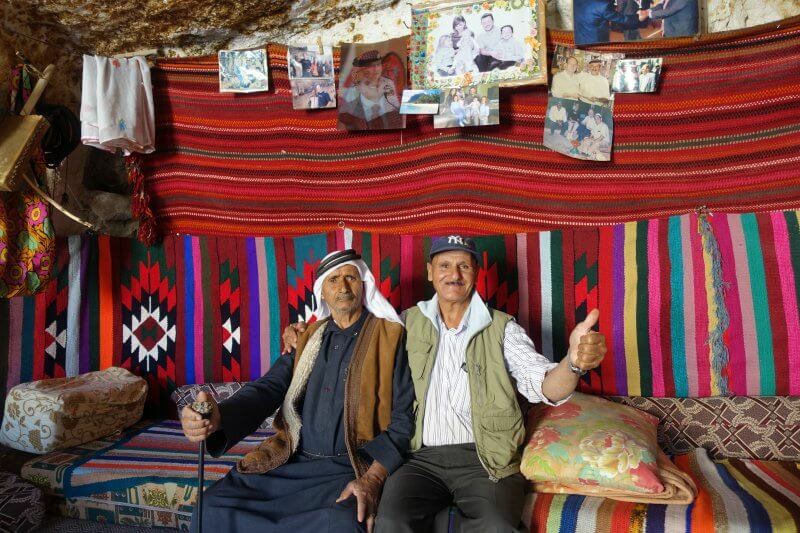 Mr Abu Ali and his friend, a Bedouin. 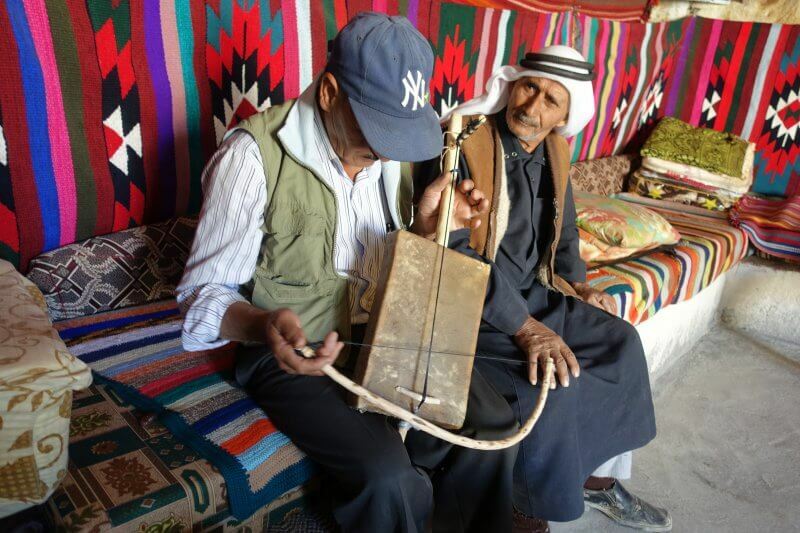 Mr Abu Ali demonstrating a traditional instrument, and his friend looking amused. Too many teas later, it was unfortunately time to leave. And that was when I finally understood what he was trying to tell me for some time, that this is the site of the ‘smallest hotel in the world‘ (at least according to some accounts). Not that he needed guests or money, but he was excited to share about it. 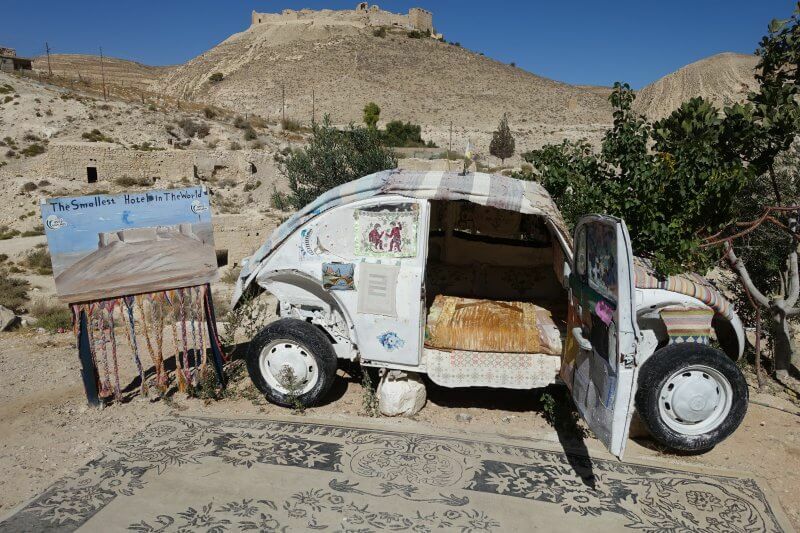 Outside the cave-like house was a Volkswagen Beetle, its interior modified to be just a bed. And that was it. 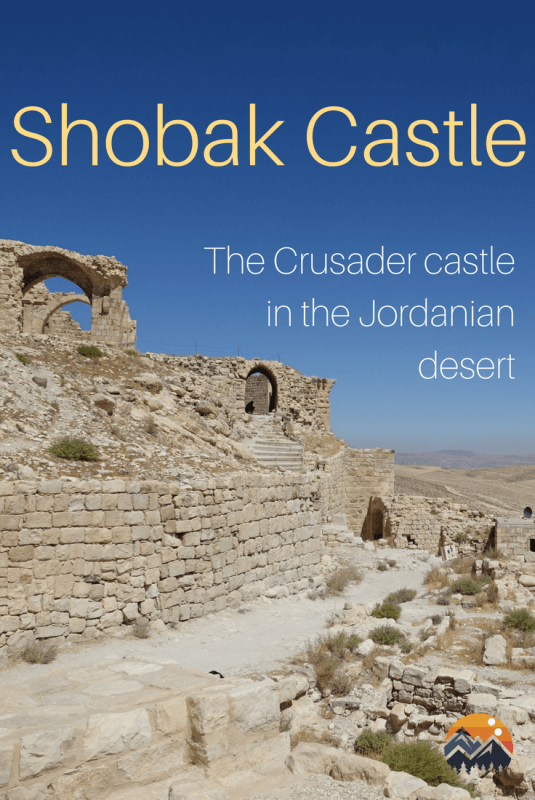 The smallest hotel (room) in the world, with Shobak Castle as its backdrop. The ‘Smallest Hotel in the World’. If you’re one for local/ unique experiences, be sure to visit Abu Ali’s hotel, for some tea or even a stay. 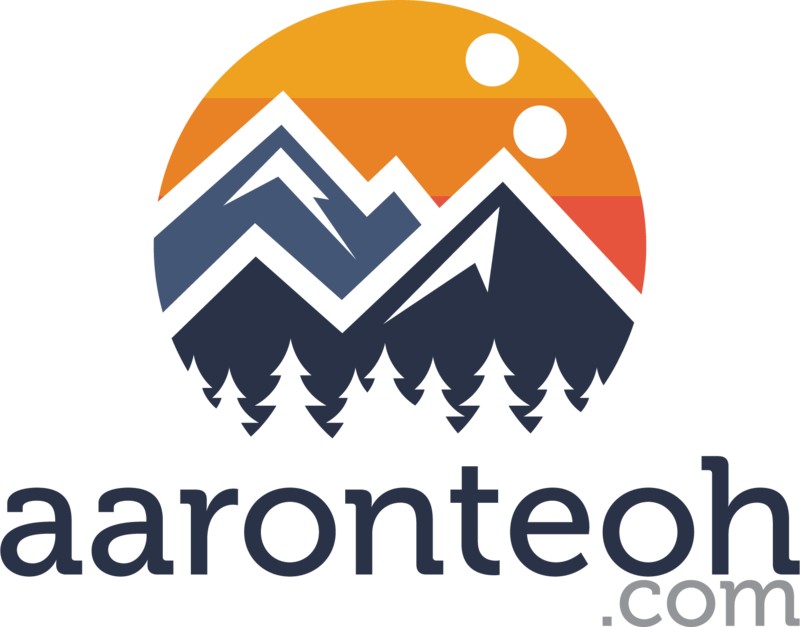 He’s also available to bring you on a hike through the mountains and valleys nearby. And there is it, the smallest hotel in the world, itself an attraction along with the castle. And now onward to the castle. 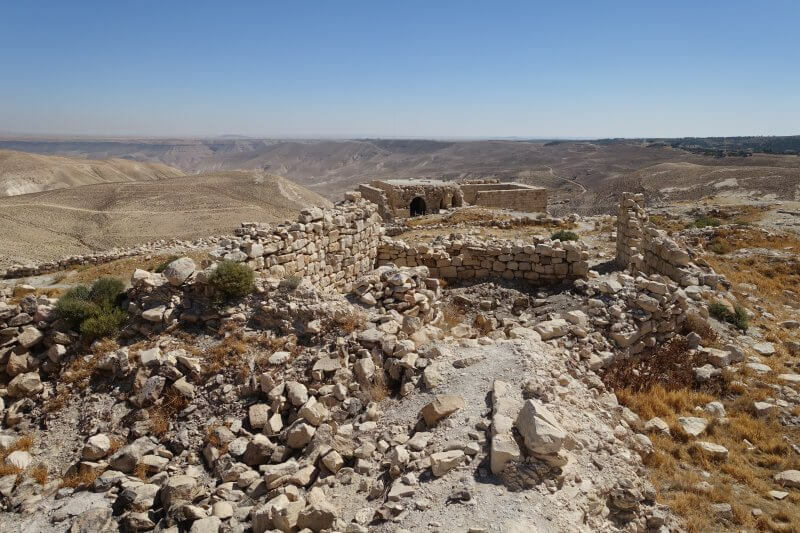 And so here, in the middle of the desert, high up on the mountain, lay the ruins of Shobak Castle. Admission is included in Jordan Pass or just 1JD if did not purchase the pass. 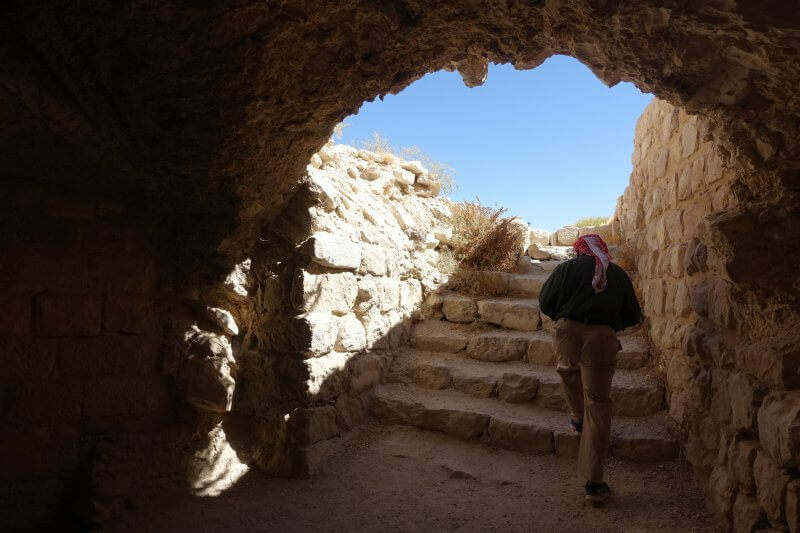 The ruins are partially excavated and restored, though no explanations are available. It would be advisable to get a guide (~10JD) but here are some shots as I wandered around the castle ruins. Through an archway. Many arches still remain standing, probably from the later Mamelukan times. 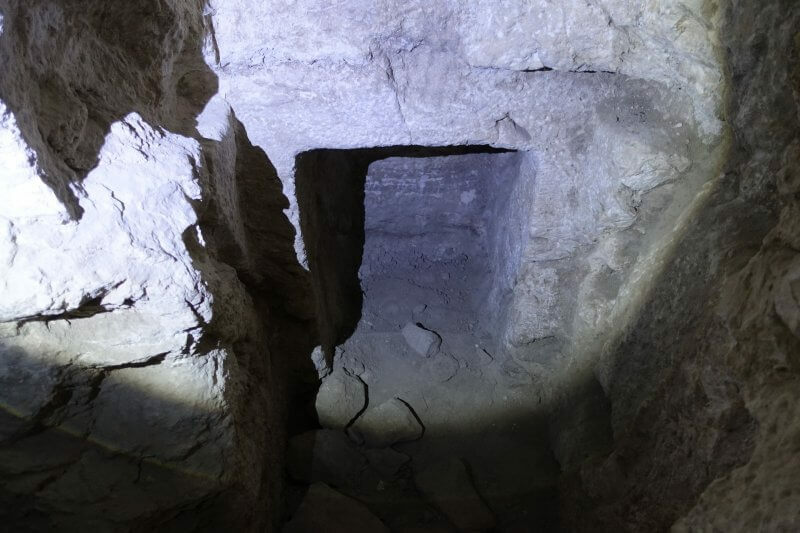 Partially excavated chambers and hallways. Remnants of the castle, perched precariously on the mountain. Some of the standing structures near the center of the castle complex. 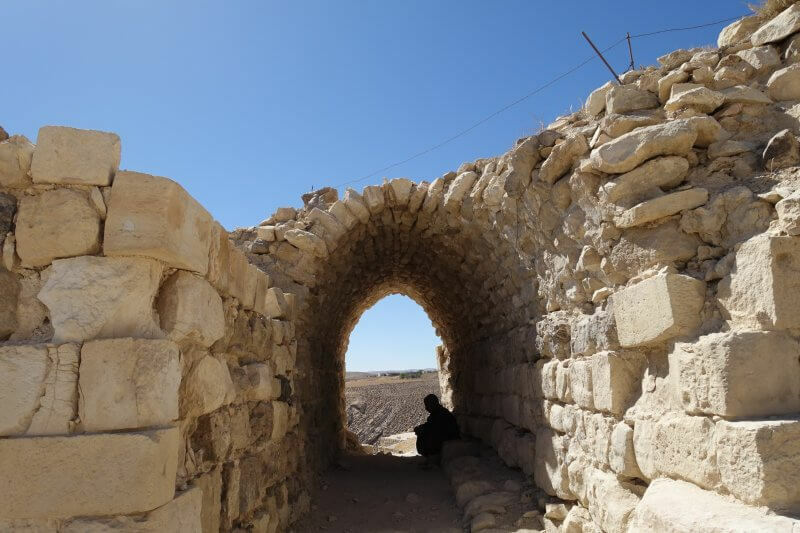 While not being able to comprehend much of what was in front of me without a guide, it was definitely an amazing experience stepping through the Shobak’s ruins and having almost the whole place to myself. There were staff working on site and they seemed to outnumber visitors. 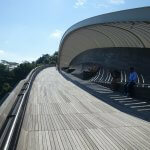 A staff member at the site taking a rest. There are a series of complicated water channels running through the site, though these days everything is dry. 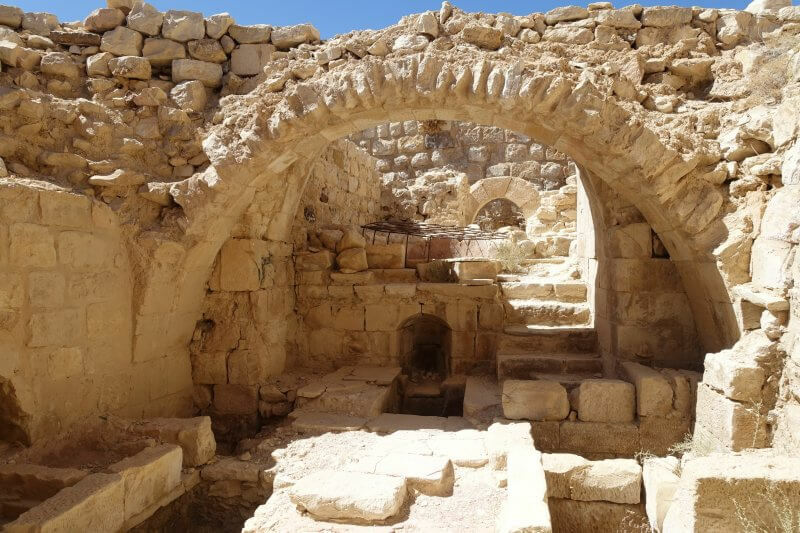 Water channels in Shobak Castle. 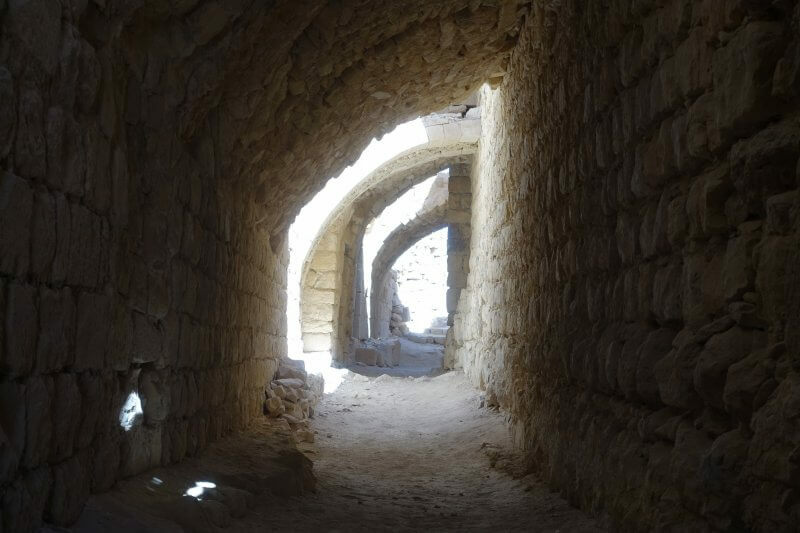 Through the lower levels of Shobak Castle, sunlight filtering through the openings. 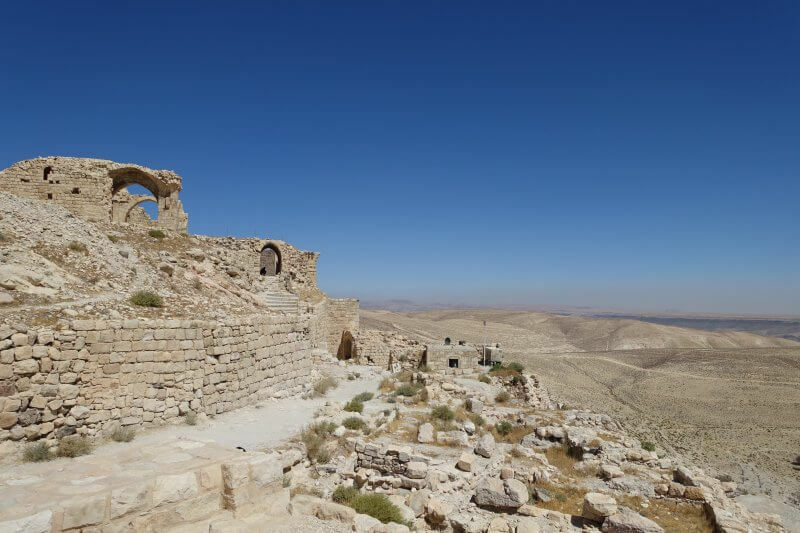 Shobak Castle, being atop a tall mountain, also offers commanding views of the surrounding desert and mountains, no less than you’d expect from a formidable castle. Get to the top of the walls and towers and admire the view, but also watch your step as there aren’t safety barriers on top of most of them. Sleek mountain curves, and a visitor arriving via the only road to the castle. Probably the same guy taking shade, from another angle. It probably takes about half an hour to check out all corners of the castle (that was apparent without guides). After about 2 rounds I was ready to leave when a guide came over and offered a short tour for a small price since there wasn’t any other tourist around then. That was when I discovered I had barely scratched the surface. Literally. The guide was a bubbly middle age man, who hummed along tunes you’d expect from a video game in a ancient castle as we marched on. Suddenly, at a spot I had passed a few times without noticing anything, he turned and disappeared behind the wall. 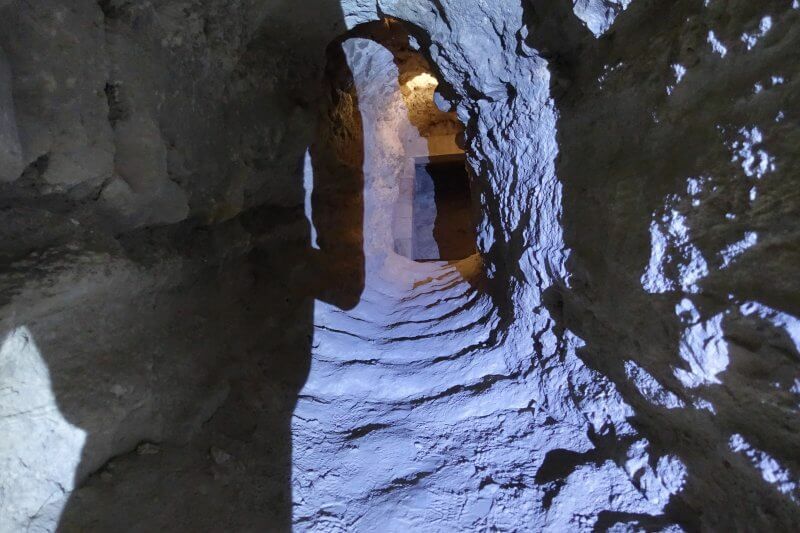 I followed, and from a hidden hall a stairway led to the darkness of the tunnels. Definitely not one for claustrophobes, as it was dark and narrow, with so little headroom I had to squat to get through at some points. As sudden as the tunnels began, it stopped. 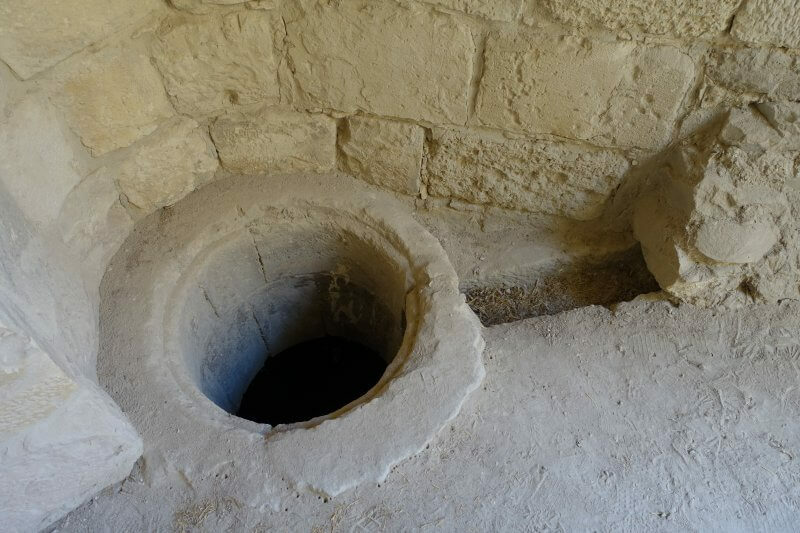 The guide indicated that this was where food and wine was stored, protected from the sweltering desert heat. Indeed, here deep below the surface, the air was way cooler than at the surface. Near the entrance of the tunnel. We exited the tunnel and headed down another one, passing the not so obvious chapel along the way. Getting back to the surface, humming castle tunes on the way. If my memory hasn’t failed me, the guide introduced this as the chapel in the castle. 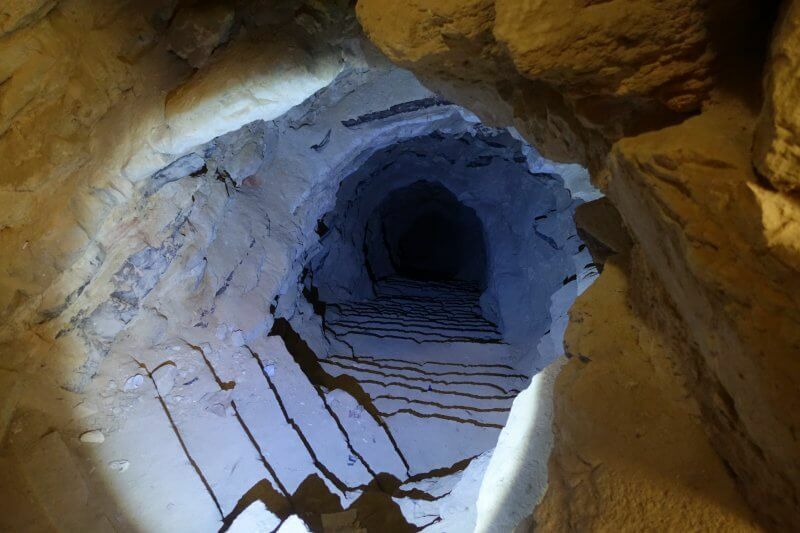 We didn’t go deep into the second one, as it went all the way to the bottom of the mountain. This one was for getting water. All the way to the bottom of the mountain, to a spring for fresh water. 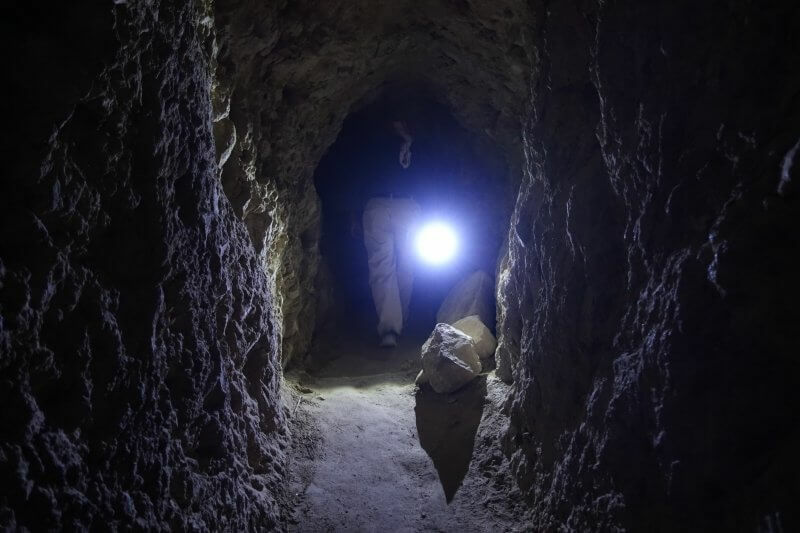 According to the guide, there is likely to be many more tunnels and chambers still hidden under the dirt. 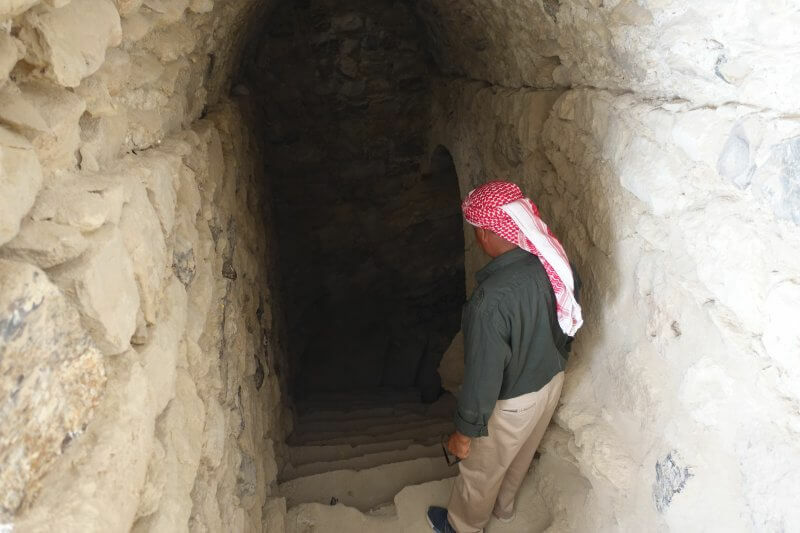 Hopefully more secrets of Shobak Castle will be uncovered in future. I’d recommend going on a full tour of the castle (though I did a partial one) to get a better appreciation of the castle, its features and stories. While there were cars waiting outside for people who had rented a driver for a day, it was difficult getting any to agree getting me to the highway. 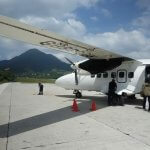 One option offered by the guide was to wait till 1pm where the workers on site leave, and hitch a ride. Alternatively, walking back to the highway would probably be 45mins to an hour. I was fortunate to finally met a traveler who was coincidentally heading to Dana Village, and got a ride out. And that concludes my adventures at Shobak, first time hitchhiking! 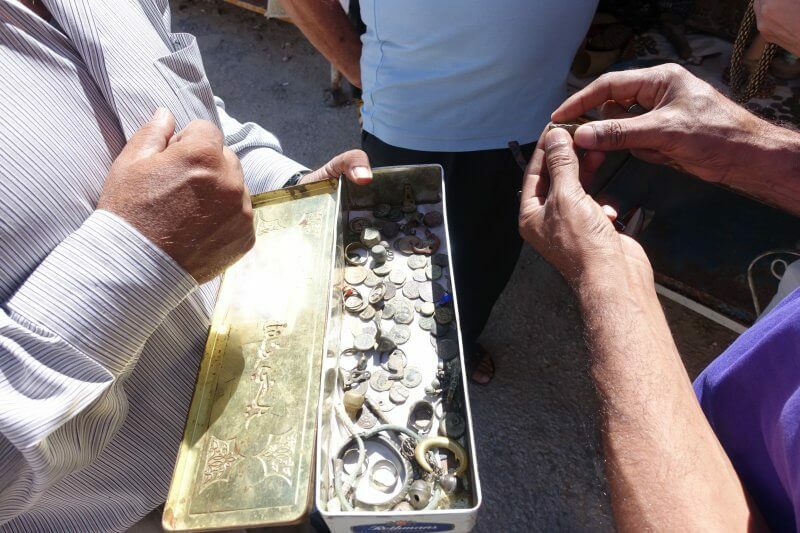 At the entrance, a man selling objects he found in the valleys nearby.